VMware's revenues are dramatic: Sales totaled $703.9 million in 2006, 82 percent over $387.1 million in 2005. Software license revenues were $491.9 million in 2006, up 71 percent over $287.0 million in 2005. Proposed underwriters for the VMware offer include Citigroup Global Markets, JP Morgan Securities, Credit Suisse Securities, Lehman Brothers, Merrill Lynch, and Deutsche Bank Securities. Selecting the finalists in this lucrative "beauty contest" reportedly delayed the filing. VMware's cash and cash equivalents at the close of 2006 were $176 million. CEO Diane Greene, 51 years old, was paid $6,417,099 in 2006. VMware sees its chief competitor as Microsoft. EMC maintains an iron grip on VMware, and this IPO won't change that. EMC has numerous hooks into this arrangement and will continue to be the controlling shareholder. Post-IPO, EMC will maintain ownership of all Class B shares and an unknown percentage of Class A shares. EMC and VMware will have several agreements following the offer. The filing states: "We [VMware] will enter into several agreements with EMC prior to the completion of this offering, including a master transaction agreement, a shared services agreement, a new tax sharing agreement, an intellectual property agreement, an employee benefits agreement and a lease and purchase agreement." EMC's control of VMware could hinder VMware's growth if other stockholders aren't happy with EMCs position, or EMC's presence discourages or hinders strategic partnerships. VMware will use its IPO to repay debts to EMC, buy its headquarters office facilities from EMC, and "for working capital and other general corporate purposes, including to finance our growth, develop new products and fund capital expenditures and potential acquisitions." VMware paid $47.3 million for Akimbi in June 2006. (See VMware Swallows Akimbi.) Of that, $45.9 million was cash. 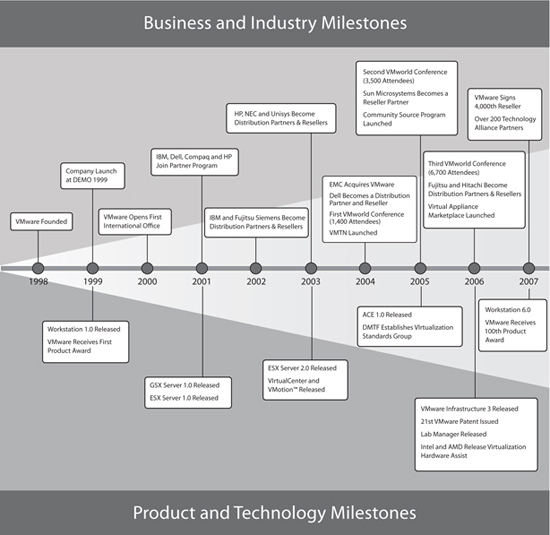 A graphical timeline of VMware to date is part of this interesting document. Click below to view. Can't wait for the prospectus!